(Monte Carlo, Monaco)- The fifth and final event of the Monaco J/70 Winter Series will be taking place this weekend from March 14th to 17th, hosted by Yacht Club de Monaco, with sailing taking place offshore on Hercules Bay in front of the famous Casino. A fleet of thirty-nine highly competitive J/70s from across Europe and other parts of the world will be participating in up to ten races over the course of the weekend. Those teams hail from Monaco, Switzerland, France, Germany, Italy, Russia, Ireland, Brazil, Great Britain, Finland, Ukraine, and Sweden. The previous regatta for this fleet was the Primo Cup- Trophee Credit Suisse that took place three weeks ago. Winning that event was Monaco’s own Ludovico Fassitelli on JUNDA- BANCA DEL SEMPIONE, with the Irish crew of SOAK RACING (Marshall King) and the Swiss team of JERRY (Tom Studer) rounding out the podium. However, the two stalking horses behind this trio were perhaps the most formidable of all. The winner of Act III was the Russian Andreï Malygin skippering MARIA, taking both the Open and Corinthian titles. And, the winner of Act II was the YC Monaco team of CHARISMA, skippered by Nico Poons. With all five crews hoping to take the overall Winter Series title in the grand finale, it will be quite a battle amongst those teams. 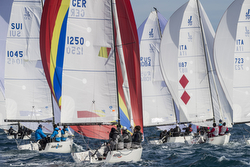 All are well-prepared and are hoping to gain valuable experience as they keep a weather eye out for how they stack up against the world’s best for the 2021 J/70 World Championship that will be hosted by YC Monaco. For more Monaco J/70 Winter Series sailing information Add to Flipboard Magazine.